eveloping a change management strategy provides direction and purpose for all other change management activities. By outlining the unique characteristics of the change and its risks and potential resistance, change practitioners set themselves and their project team partners up for success. These are all distinctly different changes, and each requires change management to be successful. Each impacts people and how they do their job. Each can suffer from slow adoption and low utilization. Each has risks associated with people not becoming engaged or resisting the change. While each of these initiatives needs change management to be successful, the right amount and approach for change management will be different. Change management strategies define the approach needed to manage change given the unique situation of your project. Below are the three steps to creating a change management strategy. How big is the change? Who will it affect? What is the timeline and does it compete with other initiatives? 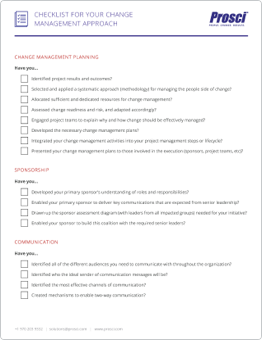 These are some of the questions you will need to answer as you prepare a strategy for managing change. Are people being impacted the same or are they experiencing the change differently? What is being changed (processes, systems, job roles, etc.)? What is the time frame for the change? What is the perceived need for this change among employees and managers? How have past changes been managed? Is there a shared vision for the organization? How much change is going on right now? Outlining the impacted groups and how they will be impacted enables specific and customized plans later in the change management process. Successful strategies of change management include a team structure, sponsor model, special tactics and risk assessment. Without these elements, it will be very difficult to develop and implement the change management plans you need for a successful project. The key to a team structure is to be specific when assigning change management responsibilities and resources. The sponsor coalition describes the leaders and managers who need to be on board and actively engaged in leading the change. The primary sponsor is the person who authorizes and champions the change. This person must be actively and visibly engaged in the change throughout the project. They also have a part in building a coalition of sponsors across the organization. When creating the sponsor coalition, choose leaders of the groups impacted by the change. Each member of the sponsor coalition has the responsibility to build support and communicate the change with their respective audiences. Are particular regions or divisions impacted differently than others? Were certain groups advocating a different solution to the same problem? Are some groups heavily invested with how things are done today? Note particular anticipated resistance points depending on how each group is related to the change. Once you have identified this resistance, you can plan special tactics to overcome it before it begins. 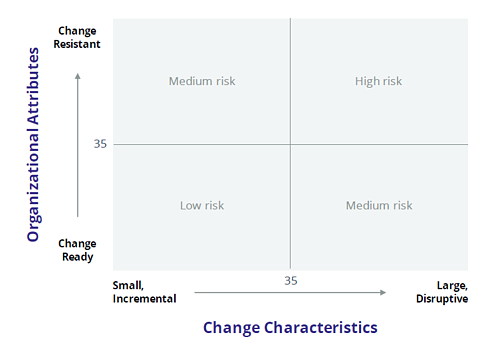 The risk of not managing the people side of change on a particular project is related to the dimensions described in the change characteristics and organizational attributes sections above. Changes that are more dramatic and farther reaching in the organization have a higher risk. Likewise, organizations and groups with histories and cultures that resist change face higher risk. In developing the strategy, the change management team documents the overall risk and specific risk factors. Formulating the change management strategy is the first critical step in implementing a change management methodology. The strategy provides direction for informed decision-making and brings the project or change to life, describing who and how it will impact the organization. The change management strategy contributes to the formulation of the five change management plans recommended by change management best practices. For instance, the groups identified in the strategy should each be addressed specifically in the communication plan. Steps for building and maintaining the sponsor coalition identified in the strategy are part of the sponsorship roadmap. Each of the subsequent change management plans and activities are guided by an effective change management strategy.